The author of The Journey of Man examines our cultural inheritance in order to find the turning point that led us to the path we are on today, one he believes we must veer from in order to survive. 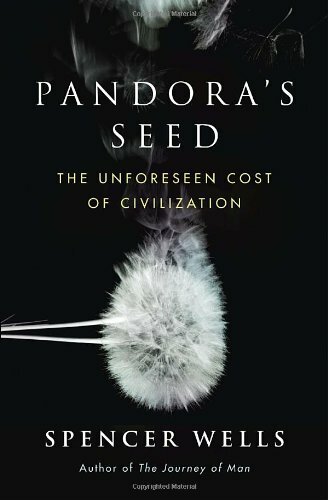 After reading Wells’ The Journey of Man and loving it, I couldn’t wait to dig into Pandora’s Seed, which promised to illuminate how “advanced” the hunter-gatherer societies were and what modern man can learn from these times for sustainability. Where there were a plethora of interesting ideas and facts, I must admit the book never grabbed me for a couple of reasons. As I said, there are fascinating ideas and much to learn from this book for sure. Who wouldn’t be interested in discovering how the world’s population explosion today has its root in the ending of the hunter-gatherer lifestyle and the dawn of agricultural society? Whose ears (or eyes in this case) wouldn’t perk up at the contention that modern society is a breeding ground for illness and disease that was totally foreign to the Paleolithic era. I know I was grabbed by Wells’ claim that our modern style of living fosters conflict and war unheard of in hunter-gatherer societies. These were just a few of the gems in this book, but getting to those gems is where the problem lay for me. One issue I had with Pandora’s Seed was the feeling of reading for long stretches not quite sure why I was reading about whatever the current topic was or what point the author was trying to make. In all fairness, the point always became clear eventually, but throughout the book, I had a constant nagging feeling of being just the tiniest bit lost. This disoriented feeling seemed to be compounded by another feature of the book. Throughout, Wells raises another topic and tells us that to learn more about the topic, he (and the reader) must go here – here being either another time, another place, or both. The ‘tale’ jumps around so frequently, the reader could be excused for claiming jet lag. He skips between centuries and parts of the world, saying in order to understand one idea, we have to go…halfway around the world or back 70,000 years. I was dizzy sometimes wondering where I was or when it was, but more importantly, why I was there. The text seemed disjointed, perhaps, too ambitious, and I ended up confused a lot of the time as to the author’s point. Eventually, he would make it, but by that time, I didn’t care. In addition, I think I was expecting some grand ideas on how to deal with the fix modern humans have gotten themselves into, and there also, I was a felt a letdown from a lack of concrete solutions. I mean, let’s face it – if put to a vote, who would opt for returning to hunting for game and scavenging for berries after they’ve seen Whole Foods and Safeway? Certainly, we can want less, which is Wells’ ultimate advice, but I already knew this without reading this book.